American toy company ERTL, which specializes in die-cast farm toys, secured the first license to manufacture Postman Pat toys in the early 1980’s. 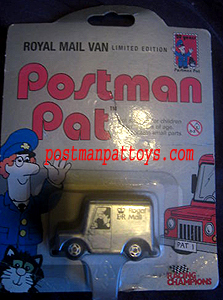 ERTL released a number of Postman Pat vehicles and figures on backing cards in blister packs. These are now becoming increasingly scarce and collectable. The ERTL Postman Pat van, a die-cast toy vehicle featuring pull back and go action, was based on the Bedford HA van with familiar ‘Pat 1’ registration. 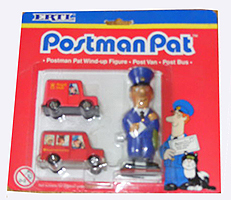 ERTL released Pat’s van on its own and also twinned with a 4″ wind up Postman Pat figure. 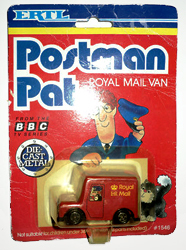 The red backing card on the Ertl Postman Pat Mail Van was revised more than once. 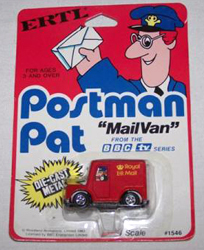 Later versions of the Mail Van featured a revised backing card and red hubcaps on Pat 1’s wheels. 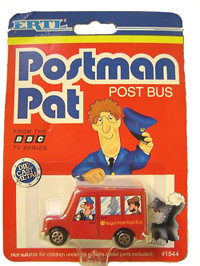 Ertl also released a quite similar carded die-cast Postman Pat Post Bus that had a picture of Pat at the wheel with Ted Glen in the back. Like the van, this vehicle proudly sports the Royal Mail insignia. 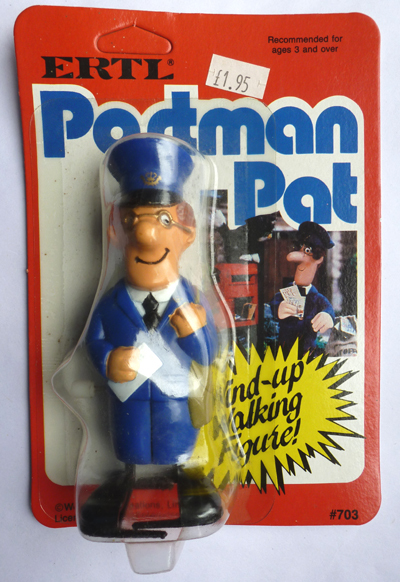 In addition, either single carded or in twinpacks with the vehicles, ERTL released both static and wind up versions of Postman Pat figures. The static ERTL Pat figure comes on a solid base. 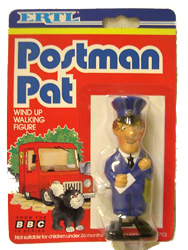 The wind up Postman Pat stands around 4″ high. The same wind up figure was released on more than one backing card design. 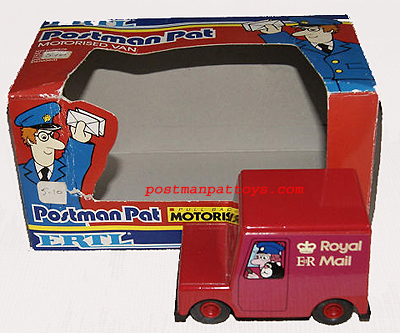 Ertl also released a carded triple pack with the Pat Van, the Post Bus and a wind up Pat figure together on the same card. These early carded figures and cars can only become more collectable with each passing year. The Ertl Motorised Postman Pat Van was the very first pull back and go Pat 1 van. Later examples of Pat 1 in plastic would have opening doors and poseable figures; the Ertl toy is die-cast with rubberised wheels and has only a sticker of Pat and Jess for the windows. In 1999 Ertl was taken over by Racing Champions. Racing Champions released a limited edition Postman Pat Royal Mail Van in silver. 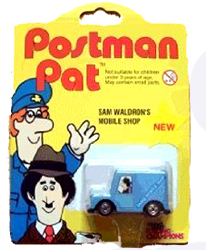 This chrome die-cast Pat van was on a silver backing card to celebrate 20 years of Postman Pat. 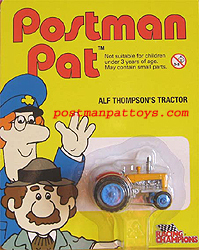 Racing Champions released other carded mini die-cast vehicles including Alf Thompson’s Tractor. 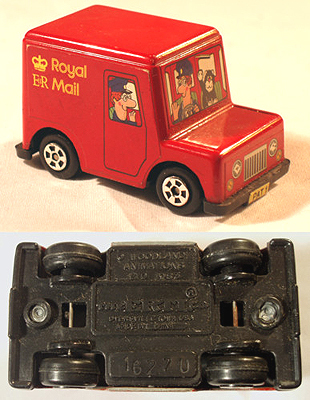 Other Postman Pat vehicles released by ERTL/Racing Champions included Ajay Bain’s Greendale Rocket and Sam Waldron’s Mobile Shop.